CAREN BLACKMORE appeared at Court Theatre in Electra and Jitney. 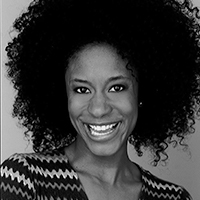 Some of her Chicago Theatre credits include: Spill (Timeline Theatre), The MLK Project:The Fight For Civil Rights (Writers Theatre), Bulrusher (Congo Square), Bodies and MiLK (MPAACT), I Gotcha! :The Story of Joe Tex and The Soul Clan (Black Ensemble Theater), and Checkmates (eta). Caren is a proud graduate of Oberlin College and has attended The National Theatre Institute at the Eugene O’Neill Theatre Center and Freedom Theatre.